MANILA, Philippines – The June 2017 Criminology board exam results or the Criminologist Licensure Exam (CLE) list of passers, top 10 examinees, top performing schools and related announcements are available at this website as PRC officially released the results online twelve (12) working days after the last day of board examination. As announced, 5,202 out of 20,819 passed the exams. The results of examination with respect to four (4) examinees were withheld pending final determination of their liabilities under the rules and regulations governing licensure examinations. The licensure exams are administered by PRC Board of Criminology headed by its Chairman, Hon. Ramil G. Gabao and its members, Hon. George O. Fernandez and Hon. Ruben A. Sta. Teresa on June 11-13, 2017 at PRC testing centers in Manila, Baguio, Cagayan de Oro, Cebu, Davao, Iloilo, Legazpi, Lucena, Pagadian, Palawan, Tacloban, Tuguegarao and Zamboanga. The schedule of online appointment for issuance of Professional ID and Certificate of Registration will start on July 13, 2017. According to the Commission’s Resolution No. 2016-1019 series of 2016 entitled “Schedule of Licensure Examination for Year 2017”, the target release date of June 2017 Criminology/ CLE result will be in thirteen (13) working days after the last day of board examinations or by June 30, 2017 (Friday). However, results may also be released earlier or later without prior notice. On the same exams conducted by PRC on October 2016, results were released after twenty-five (25) working days. On April 2016, results were out after eleven (11) working days while twenty-four (24) working days during October 2015. Forensic Ballistics, Questioned Documents Examination, Polygraph -- Lie Detection, Legal Medicine) 20%; Crime Detection And Investigation (Fundamentals of Criminal Investigation, Traffic Management and Accident Investigation, Special Crime Investigation, Organized Crime Investigation, Drug Education and Vice Control , Fire Technology and Arson Investigation) 15%; Sociology of Crimes and Ethics (Introduction to Criminology and Psychology of Crimes, Philippine Criminal Justice System, Ethics and Values, Juvenile Delinquency, Human Behavior and Crisis Management and Criminological Research and Statistics) 15%; and Correctional Administration (Institutional Corrections, Non Institutional Corrections) 10%. Criminology is one of the programs with huge number of examinees being administered by PRC. During the same exams conducted October 2016, 10,901 out of 34,768 examinees passed. University of the Cordilleras (UC) ranked first in the top performing schools' list having 59 out of 62 examinees passed or 95.16% overall passing rate followed by King's College of the Philippines Inc. having 62 out of 70 examinees passed or 88.57%. Christine Joy Almano Capalar from Sultan Kudarat State University - Tacurong ranked first in the exams garnering 91.55% rating followed by Genzy Pastolero Llorito also from the same university having 90.85%. On April 2016 CLE, 3,928 out of 16,435 passed the exams. UC ranked first in the top performing school having 105 out of 107 passed or an equivalent 98.13% overall passing rate followed by Lipa City Colleges with 57 out of 62 examinees passed or 91.94% overall rating. Meanwhile, Jared John Francisco Adolfo from University of Mindanao - Tagum ranked first in the said exams garnering 88.15% rating. He was followed by Harold Tubongbanua Sarita from De La Salle University - Dasmariñas having 88.00% and Jonathan Apolog Langbayan from Mountain Province State Polytechnic College Bontoc having 87.90% rating. 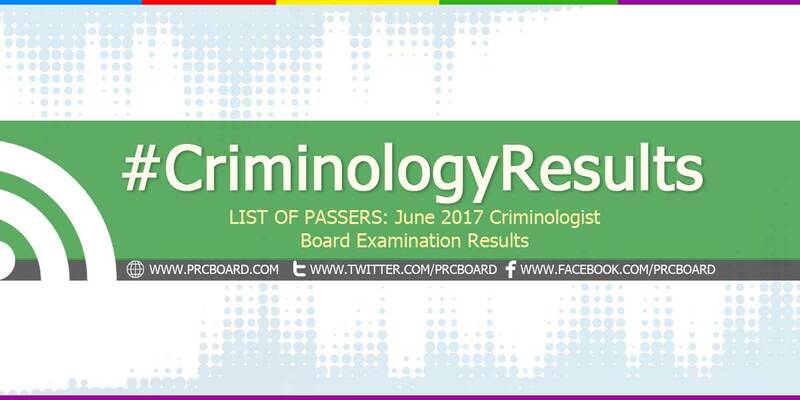 To receive up-to-date news about Criminology CLE results for June 2017, we advise our visitors to bookmark this page, visit PRC official website or follow us at our social media pages via Facebook and Twitter. Stay tuned everyone! As results may also be released earlier than the target date. God bless! dalawang araw na kong balisa. LORD give me a chance to pass the board exam. You are my greatest weapon. LORD sana makapasa po kaming lahat sa exam pinapangako ko na magiging mabuting police ako. Lord sana po mka pasa kmi lahat sa board exam..para kmi po ay mag lingkod sa bayan God Bless us all. God bless us brothers/sisters, pray for our future , still awake , still waiting, still believing . Good luck and God bless to all . Sana pumasa iyong gf ko para sabay kaming mag apply sa PNP!! i hope im the one to past the exam. lord for give me. tanx..
pano po malalaman yung rating ng CLE ngayong june 2017 ?? ?